Ten great works. Five paintings and five sculptures. A slice through two decades of British abstraction. Something of a suggestion of the breadth of endeavour during these years, an uncovering of a few of its lesser known paths, and an opportunity to discover new contrasts and confluences within it. More prosaically, a chance to see ten great examples of abstract art. Provisionally grouping potential contrast and confluence, we might see the hanging diagonal of Anthony Caro’s Ceiling Piece D (1979) – on its UK debut – against the diagonal dripping of Alan Gouk’s Vinaigris (1975). One in steel, delicate, beautifully evading gravity, the other plunging deep, powerfully visceral. Then perhaps Caro’s deft touch in tandem with the wit with which Peter Startup echoes the figure through his Metamorphic Form (1965). Or then the latter’s mysterious and evasive logic against that which underpins the more resolutely abstract construction of John Panting’s untitled (1973) – Panting’s sculpture, recently rediscovered and not seen since his posthumous Serpentine retrospective, drawing attention to an aspect of his practice separate from but as compelling as that seen in the recent Poussin solo show. Next to the closed geometry of the Panting, the square of Garth Evans’ Frame (1970) – stylistically balanced between the clarity of his Sixties fibreglass sculpture and the more introverted linearity of his Seventies work - lies in open, available apparency. The cool poise and ambiguous precision of both sculptures plays off the earliest work in the show, Robyn Denny’s Madras (1961), whose vertical bands of colour anticipate the hieratic order of his better-known later work. 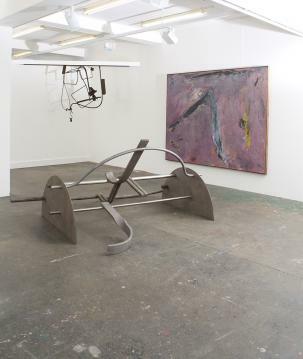 Alternatively, the Evans and Panting could be seen against the heavy, loping steel of Tim Scott’s Pool II – a rare example of his work from this period – all three, and the Caro as well, showing strands of development away from and out of the possibilities of Sixties “New Gen” sculpture. The Bridget Riley featured - a gouache study dedicated to Ben Nicholson (1966) - projects itself weightlessly, its slick black and white curves flicking typically and seductively off its surface. The Riley’s lines could tie it to the Denny, and its undulations to the Scott, but its ease, and the joy it takes in this, are maybe best comparable to the hard-edged bubbles of colour lassoed diagonally across John Hoyland’s 28.3.64 (1964). Then again, going almost to back to beginning, we could see Hoyland’s sweetness as the antithesis of Gouk’s Vinaigris, and finally close by suggesting the insight gained, or the resolution hinted at, through seeing between these opposites the rich flung shapes of Douglas Abercrombie’s Coch-y-Bondu (1977).